OUR 1/2" MODEL WILL FLOW APPROXIMATELY 550/600 GPH MAXIMUM. THE TOTAL HEIGHT WITH FITTING ATTACHED ON TOP IS 4". Standard brackets fit frames of glass tanks with 1-3/8" width max. 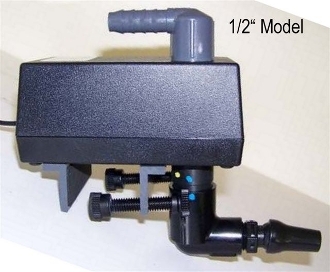 1/2'' MODEL is supplied with a 90 degree fpt x barb fitting for hose connections only. IF YOU NEED A fpt x fpt BLACK inlet for hard plumbing please put in comment box. A separate extra charge of $5.00 will be added manually after order is placed. Inlets are ADJUSTABLE for an easier installation of incoming water supply. FREE UPS GROUND OR PRIORITY MAIL SHIPPING IN CONTINENTAL US. CANADA & INTERNATIONAL ORDERS WILL RECEIVE DISCOUNTED SHIPPING!